Choose your ‘when you don’t really need a bag’ bag. Clutches, satchels, bucket & shoulder bags. Clutch bags. The bags that aren’t really bags. There are two types of women: the ‘let’s bring everything’ women and the minimalists. For those who like to leave the house with only the essentials, and don’t exactly love carrying a bag, clutches are your go-to. 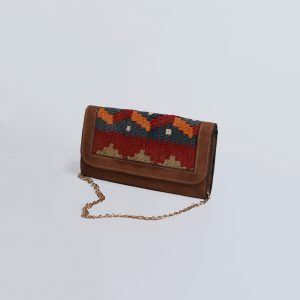 Carry your clutch or use it as a shoulder bag, with the stylish cord. Grab your bank card, some cash, and your favourite lippy, and put it in your clutch. It’s the perfect grab-and-go ‘bag’, which is really just a big purse. Add Lotus Handicraft to your online shopping bookmark list. Not sure what type of bag you want? Find it, here. Iran: The home of authentic, tribal Persian kilims. Fascinated by the Middle East, but don’t see yourself travelling there? Love with Persian rugs and other unique, one-of-a-kind products? Like India does cotton well, Iran owns kilim. Kilim goes back a few hundred years but it’s not something you see often, especially in Australia. Lotus connects you to kilim. If you’re in Adelaide, come pick up your shoulder bag and meet the designer. We post globally, too, so no matter where you are, we can send it to you. With every piece, you’ll feel that the heart of Lotus is our love for uniqueness – perfectly captured by your wearable new art.